Don’t forget – we are planning to do the early morning holiday lights run on Thursday 6 December. Please let me know if you think you can NOT make it. We will send out the specifics next week but we will start at 6 am and you should be back to SJW around 7:15. It really is a special run so I hope you can all make it! Hopefully you received the email last week about booking for the hotel in Milan for the race. Please let me know if you did NOT receive that email as well as if you have any questions. Some of you may have already purchased new shoes since you started running, but some haven’t. If you haven’t, it would be good to get a new pair before we start increasing our mileage in January. If you’re going back to the US for the holidays, you could pick up a pair there (that’s what I did my beginner year). It’s a good idea to go to a store that knows what it’s doing – that will evaluate your gait and suggest an appropriate shoe for you. In London, Runners Need (a chain with many locations) or the Asics store on Oxford Street offer gait analysis. You want to get new shoes soon so you can make sure they are comfortable and don’t cause any issues. When I was a beginner, I ran the first few months in cross trainers and when I got “real” running shoes, my knees started hurting because I was landing differently in the new shoes. It took several weeks of alternating with my old and new shoes before everything settled and I was glad to have that time. Every year, the M/W/F group organises a gift for the employees at our local St. John’s Wood Starbucks. You are welcome to contribute to that effort if you would like (even though we tend to gather at Pret…). We’re suggesting a £5-10 donation if you’re inclined to contribute (donations in an envelope with your name can be handed to me before Thursday, December 13). We also traditionally organise a basket of home-baked goodies, which we deliver along with the cash gift on our last morning before break (Friday, December 14 this year). Email wrwlondon@gmail.com if you’re up for baking. For Thursday, we are going to run down to Hyde Park and we will be doing 2 25-minute intervals with a 5 minute walk break in between. We will end at the Starbucks at the Green Park tube so BRING YOUR OYSTER CARD! From Barclays, head down Circus Rd and turn left on Lisson Grove. 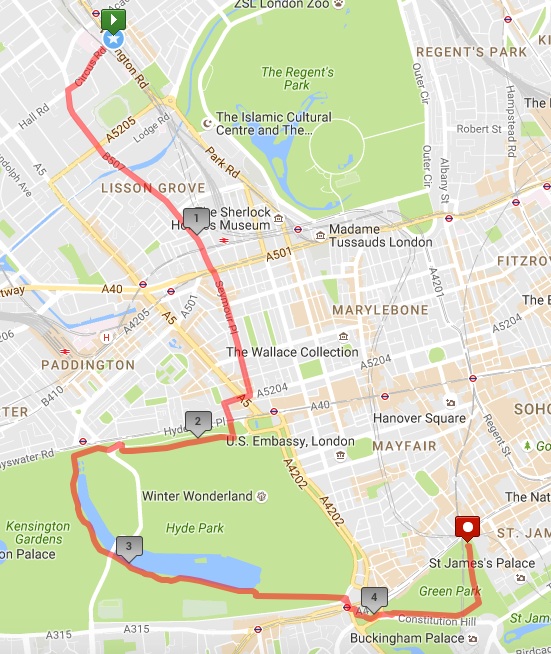 Run to Marylebone Road and cross over to Seymour Place. At the end, turn right, cross over Edgware Road (be careful at this light) and run straight for one block on Seymour Road. Turn left on Stanhope Place and then cross Hyde Park Pl to get into Hyde Park. When you see the silver globe, after crossing North Carriage Dr, turn right. Follow that path to the road (N Carriage Drive) and cross the road (be careful!). Run down the hill to the Italian Gardens and turn left to run along the gardens (the gardens will be on your left). Keep to the path closest to the water and run through the tunnel under the road and past the Diana Memorial Fountain and the cafe. Keep along the water and at the end, bear right to run down onto the path (keep out of the bike path on the right). At the end of the path, go right to make your way out of the gates to Hyde Park Corner and cross over Knightsbridge to run through the Wellington Arch and into Green Park. Run straight and then turn left to go towards the tube station at the far end. Last week was HUGE! 3 15-minute segments – that is fantastic. We are SO proud of all of you. This is another lengthy email, so please bear with me. This week, we are keeping it steady with the same 15 minute segments. For those of you going away for the ASL break, just do your best to get in the runs. Remember, beginning this week, the Tuesday run is now a total of 45 minutes exercise time and your weekend run should be 30-35 minutes total. Break it up with walk/runs however feels most comfortable to you.I am here on Thursday so I am planning to coach the run as usual assuming there is enough interest. Please respond to let me know if you will be here. Let’s give us an extra few minutes of sleep and meet at 9 am. When you email, let me know if you have a preference for doing a loop back to SJW or a destination. There is an Portuguese bakery in Kensington we could run to, but if you need to get back to cook, it may be better to do a loop. I want to say a little more about pace and such. We are now getting to the point where the group may start to split up. This is completely normal. Please please do not worry about your pace or the pace of anyone else in the group. You don’t need to worry about going faster. ALL of you are running at a pace that is completely standard for beginner runners. And honestly, we will stay at a similar pace throughout the program. You should not be concerned at all about being fast enough to do the race – it is not about speed, it’s about finishing and finishing with a smile on your face (and sweat on your brow). As I’ve said before, if you are feeling like you don’t want to talk, you are going too fast. With that in mind, I also want to talk about headphones. I know some of you have said you need the headphones to get through the run. If you are feeling that way, you may be going too fast. It is hard to run next to someone who is wearing headphones, even for us coaches. We are a social group and it can make your fellow runners feel that you are not part of the group and also make them feel isolated because the person next to them is sending the signal that she wants to be left alone. It feels like people may be getting in the habit of wearing headphones in the group and that is not what we are about. If you absolutely HAVE to have music, please only wear one headphone. Come and talk to me if you have concerns about this. I have also heard some people worry about their gait. Everyone has her own gait and it’s generally not a good idea to try to change it unless a licensed professional has said there is a problem and is guiding you. Some people hit harder on their heels, some run flat, some run on their toes – it’s ALL fine. We are not trying to be Olympic athletes with the perfect positioning for the fastest marathon (and those Olympic athletes have many professionals guiding them). If you are hurting, please please see a physio or osteopath to get a professional opinion. And now for the lengthy part of the email. Feel free to skim or skip it – I know it is quite verbose! With Thanksgiving this week and many of us having food on our minds, I thought it would be a good time to talk about nutrition for runners. The information here is taken directly from Paula, the founder of our group (she is the “I” in the text). She has years of experience as well as trainer certification. That said, everyone is different and you need to figure out what will work best for you. Let’s start with protein because that is probably the most critical component as you increase exercise intensity or duration. When you run, you create tiny tears in your muscle fibers and protein is required to repair that damage. For female long-distance runners, experts suggest taking in about 90g a day (or 1.6-1.8g/kg of body weight). That’s a lot of protein – it takes a concerted effort to get there and at our level, we don’t need that much. Make it “clean” protein when possible – lean meats, fish, nuts, yogurt, lentils/pulses and low-fat milk (this is the one low-fat product that most nutritionists agree is fine). Most professional runners eat salmon like crazy – I’ve never heard a nutritionist say that salmon is THAT much better than other fish, but a lot of very experienced runners sing its praises. A lot of trainers will encourage you to increase your carb intake, but I don’t fully agree (particularly for our type of running). It may be necessary for athletes training at extemely high intensity zones, but that’s not what we’re doing. Bottomline…. we are trying to teach our bodies to use fat as fuel. Fat is easier to access as an energy source and requires less fine-tuning in terms of timing carb intake during exercise. Our bodies have about 1000-1200 “easy access” calories available which will get most ladies about 10-11 miles (depending on their weight and fitness level). After that we will use gels (carbs) to fuel that last 2-3 miles of a half-marathon. If you increase your carb intake on a daily basis, then your body starts expecting a constant feed of carb fuel and may begin to resist going to fat as a fuel source. Your body needs carbs so don’t completely cut them out – just choose clean carbs, complex when possible, ie. grains, wholewheat products, basmati rice (the longer the grain the better – long grain basmati is better for you than even brown rice). Bread is not evil, just don’t rely on it as your major carb source. Sourdough bread is better for you (usually made with naturally occuring yeast) than traditional loaves. Fat is necessary in our diets. I would make a nutritionist cringe by explaining it so simply, but basically fat creates a slower release of energy/fuel. It’s as though you’ve taken a time release medication rather than a typical dose when you combine a bit of fat with your other nutrition sources. Fat from avocados, olive oil, nuts, etc is obviously better for you than fat in brownies, cookies, etc (sorry about that!!!). Some current research is suggesting it is actually it’s the sugar in those products rather than the saturated fat that is causing a big problem with obesity, diabetes and heart disease. We can let the scientists battle that out – for us, just try to get your fat from more natural foods. With all nutrition, the closer you can get to whole food, the better (i.e., apples are better than applesauce, whole vegetables are better than pre-packaged ones). Basically, the closer your food looks to how you would find it “in-situ”, the better. That concept is one thing on which all nutritionists/dietitians seem to agree. That could be a half bagel with cream cheese, yogurt with nuts (if the nuts don’t upset your stomach), a smoothie, or try oatmeal/porridge – it wins the prize for a near-perfect carb/protein/fat mix for pre-run. Most people find simpler carbs work better before a run than complex carbs as they are more easily digested (so a plain bagel instead of a wholegrain/seeded bagel). Ideally, eat the pre-run meal 90 minutes before running. Sometimes that is just not possible, so the closer to the run that you eat, the more you should consider simplier carbs for easier digestion. The latest research on coffee/caffeine pre-exercise, suggest there is no impact on performance, but a huge impact on perceived exertion. This is interesting to me – basically these new studies conclude that given two athletes who have eaten the exact same thing, and are asked to perform at the exact same level, and who have the exact same result feel differently about how hard the session was. The one who has caffeine in their system will feel it was easier – their “perception of exertion” is lower. The protein piece is critical as is the timing of this food. Again, a nutritionist/scientist would cringe at how I try to explain this, but here we go… when you exercise your muscles are agitated/traumatized. The cell membranes temporarily become more porous (instead of a wall, it’s more like a mesh allowing the flow of nutrients easy passage). Some post-run ideas would be a latte and yogurt, a latte and a piece of fruit or a latte and half a skinny muffin. I’ve attached the Starbucks nutritional info to make this easier for you. Basically a tall, skinny latte has 14g of carbs, 10g of protein and 0g fat – so you’re looking for another 35g of carbs in addition to the latte. All of this pre/post run info would apply to longer runs and what qualifies as a long run is different from runner to runner. You are probably just fine eating whatever you normally consume until about mid-end January when our runs lengthen. We’re really moving along now in our training and you guys are all doing AMAZING! Last week was another jump and you all took it in stride. We will be going up a bit more this week but we will hold the course for next week for Thanksgiving week.This is a very long email, sorry. But it has important information so please do your best to read it. First, just a quick reminder that the orders for 2018-2019 WRW logo clothing will close tomorrow at 5pm. Please don’t forget to place your orders, as we do not order extra gear, and we’d hate for anyone to miss out! Here’s the link again: WRW Kit order form This is completely optional, I just didn’t want you to forget. We have some significant increases in our training coming up, but you all are ready – really! But there are some important things we need to discuss, so bear with me because this email is a bit long. We have reached a turning point in our training with this coming week’s run. We will be running 3 15-minute segments with 3 minutes of walking in between. Think about that – remember running 60 seconds those first weeks and we all thought we were going to die. Then two minutes…. well, it might as well have been a lifetime. We know it’s not easy – learning to run is challenging, but think of where you’ve come from. We’re putting in an hour of total time now – it’s amazing what you’re doing. We are at a critical point in our training where the routine begins to change… so I’ll just jump right in and start explaining. 3 runs a week? If you are aiming to do the half-marathon in the spring, you should be adding a third run each week if you haven’t already. It will make the race a lot easier if you can get in a third run as much as you can. Let’s be clear – it’s never easy running 13.1 miles, but the more miles you’ve put in, the more comfortable your body will be running that distance. Varying each run – This is the good news….. We have progressed to the point where our runs/routes will begin to vary. 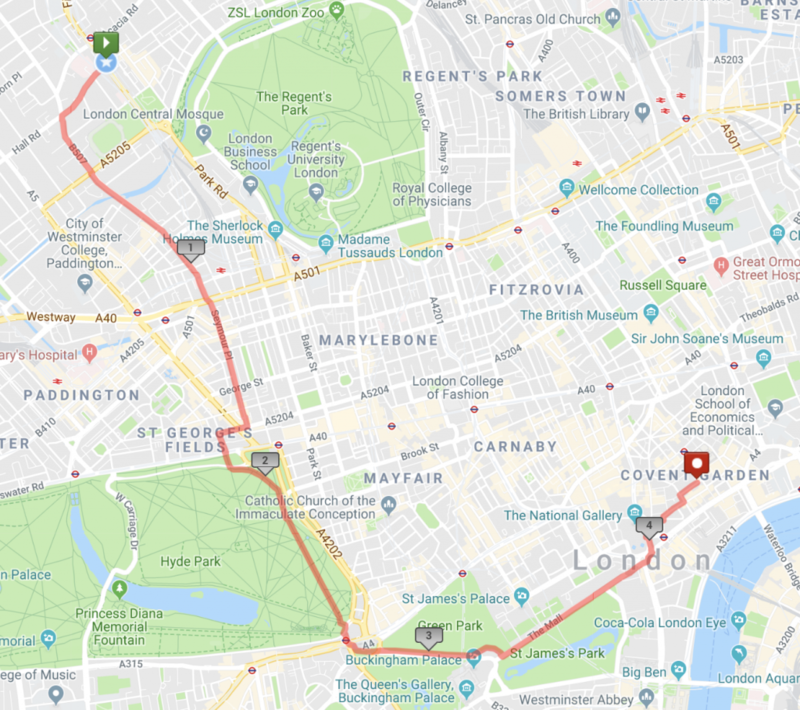 Next Tuesday 20 November (or whichever day you are doing your second run) you will no longer simply repeat the route we did together the previous Thursday. After this week, you will be doing one long run with your coaches on Thursdays, one medium run and for the third weekly run, you will do a short run. The medium run (beginning Tuesday 20 Nov) will be 45 minutes total exercise time. Feel free to break that up into whatever intervals you are comfortable with. If you’re not sure where to start, you could try doing a 2 minute warm-up walk (after your warm up exercises) followed by three 13 minute jogging intervals separated by 2 minute walking breaks and 2+ minute walk at the end. The third run should be 30-35 minutes total exercise time. This also can be broken down into whatever length intervals make you happy. A place to start may be…. 2 minute warm-up walk followed by three 8-9 minute intervals separated by 2 minute walks. Particularly for this 30-35 minute session, some of you may be interested in doing a walking warm-up then just jogging slowly until you feel you need a break. Then walk for a couple of minutes and jog some more until you reach the 30-35 minute total time. If you want to try that, here are a few tips. First of all, run SLOW, like what we do on Thursdays. Second, don’t look at your watch. Do your warm-up then start jogging. Look around, watch the people on the streets or in the park, think about anything but running, notice the yellow/gold/red leaves, make a grocery list in your mind, think about what book you want to read next or where you want to go on holiday…. anything but running. When you’ve had enough, then check your watch to see how much time you did, take a walking break and carry on. You may just amaze yourself. On these additional runs, go wherever you want. You know how to get to Hyde Park, Regent’s Park is right there, and access to the canal is super easy. We’ll help you come up with some other ideas if those routes get boring. Consistent Training – For just a minute here we’re going to be a little bit more tough than usual. These Thursday long runs are getting more and more important. If there is any way you can get there, please join us. We know some of you have things you have committed to ages ago and we get it. Until now it has not been a problem because we are simply repeating the Thursday run on the following Tuesday. We’re not asking you to cancel travel plans or quit courses. We are all busy and there are always weeks here and there when we can’t run. Not a problem! The bottom line is this… if you cannot make the majority of the Thursday runs, particularly in the new year, but truly even throughout December, it will be very difficult for you to contemplate doing a half-marathon. We’re not trying to be mean or demanding or threatening, just realistic. As our Thursday long run lengthens, you will want and need help, advice, pacing and someone to complain to. We will be discussing fueling/hydration and trying out different options in that regard. Those are things we need to learn/practice together – it’s not the same as reading it in an email. The other one or two runs each week are much, much less important. That’s the end of that speech….. next topic! What’s your pace? We are beginning to settle into pace groups. This is natural and is not a reflection of your fitness level. We need to each find the pace that feels comfortable. Some of you have longer strides, some take smaller steps, some of you have long legs, some of you are tiny and have to take two steps to every one stride of a taller runner. It’s not only down to height – some tall people have a natural up and down movement with less forward propulsion. Most runners say that if they are asked to adjust their natural pace, things start hurting so it is important to find your natural speed. We need to start thinking about where in the group you are pace-wise. For the race, we will divide ourselves up based on these training paces so everyone will have a group and a trainer to run with. During our training runs start trying to identify others in the group who are running your pace. Who do you seem to naturally fall in sync with? You probably have noticed that we don’t talk about pace in terms of numbers or precise times in this group. It’s not important to have a specific number – it is important to know what feels comfortable to you…. not too fast, not too slow, but just right! Hydration – As our runs get longer, we need to start taking in fluids while we’re running. Hydration requirements vary vastly from runner to runner, but experts suggest targeting about 500ml of fluid for each hour of exercise. Our needs are probably less than that as we are operating at a lower intensity level doing long distance training. You may consider buying a belt that holds little bottles, a tiny camelback (one that sits very high up on your back), or one of those bottles that slips over your hand. I wouldn’t recommend a large backpack – it changes your gait. This need to carry water applies only to your weekly long run. You are fine running 30-45 minutes if you drink before and after your session. I understand that you have no point of reference, so you have no idea how well you are doing. We’re running about 4 miles now, over and over again. I know it’s not easy, but you are doing it. You have the worst of it behind you. It’s A LOT harder going from 0 running minutes to 1 running minute, or from 1 to 2 minutes – those are difficult beyond belief. In the next few weeks, we are transitioning into straight running, no designated walking breaks. That may sound scary, but think about where we run. Even though I say we are running 50 or 60 minutes non-stop, there will be street crossings. You will learn to pray for the little “red-man light”. My message is that you can do this. You have each other to lean on and all of your coaches to help out however we can. So… on to this week! This week for the route, we are going to Notting Hill via Elgin Avenue in Maida Vale. Head down Circus and continue on to Hall. Turn right onto Hamilton Gardens and left onto Abercorn. 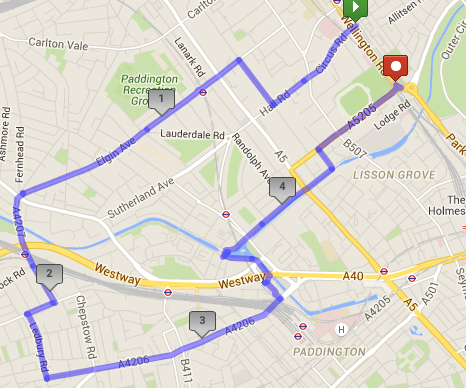 Cross Maida Vale and continue on Elgin Ave until Harrow Road. Cross Harrow and continue on to Great Western Road. Turn right onto Westbourne Park Road and then left on Ledbury Road. Turn left onto Westbourne Grove and run until you get to Paddington. Cross over the tracks and go left, circling left around the basin to enter the canal. Go left on the canal and then take the first right up and over the canal to circle back towards SJW. Exit onto Blomfield Road, cross Maida Vale and stay on Aberdeen Place. Turn left on Cunningham Place and right on St John’s Wood Road. Take a left on Grove End and then right on Circus to get back to Barclays. Well done last week! That was a big jump up in time – going from 7 minute to 10 minute segments. That’s HUGE! I know it was hard, but you did it! This week we will increase our intervals up to 12 minutes. If you hadn’t noticed, we are increasing our time faster now so it is so important to make sure you are getting at least the Tues/Thurs (or substitute days) in and it will be much easier on you if you are doing that third run on the weekend. It will be easy to suddenly feel like you’re falling behind and we don’t want that to happen! Some of you may be away for ISSTs (the high school end of the season sports tournaments for those of you without ASL high schoolers) this week so just try to get the run in when you can. Don’t forget to keep it SLOW on Tuesdays. You can get an app for your phone – I recommend MapMyRun, Strava or RunKeeper – that will track how fast you are running. You should be running between a 12:30 and 13:30 minute mile at the most (and it is completely fine to be slower). I would recommend that one person be in charge of the timing for Tuesdays and another person keep track of the speed. You should pause the app when you walk so you’re accurately timing the run portion. For your weekend run, it’s OK to go a bit faster because it’s for a shorter time and distance. But don’t kill yourselves! For the 2 destinations, we are ending where there is a good-sized place for coffee for those who can hang out a bit. Head down Circus and turn left on Lisson Grove. Follow Lisson Grove to Marylebone Road and then continue on Seymour Place until it ends. Turn right, cross Edgware Road and turn right on Stanhope Place and enter Hyde Park. After crossing N Carriage Drive, turn left and then curve right at Speaker’s Corner to run down the east edge of the park. Exit at the south entrance, crossing the street and running through the Wellington Arch and into Green Park. Run straight through until you reach The Mall. Turn left and run down The Mall all the way to Trafalgar Square. Run up the east (right) side of Trafalgar Square and turn right onto William IV Street, shortly after St Martin-in-the-Fields. Take a left onto Chandos Place and another left on to Bedford Street and finally a right onto Henrietta Street to reach Covent Garden. Le Pain Quotidien is close to the London Transport Museum and has good seating capacity.